New to the internet: MIG Commercial Trucking! Along with A3K Advertising, I’m excited to have helped design and implement this established Fort Worth-based insurance broker’s first website. With limited existing marketing materials to build from, we worked closely with the client to help build a brand and message, helping establish a solid base for future efforts. The WordPress site features full plug-in-play design functionality, all-in-one SEO capabilities, and a blog to help support the launch of the client’s upcoming content marketing efforts. A key SEO initiative is a Feature Markets section, which will be used to target specific prospects in different areas of the trucking industry. A careers section has also been included to help the company reach its growth objectives. 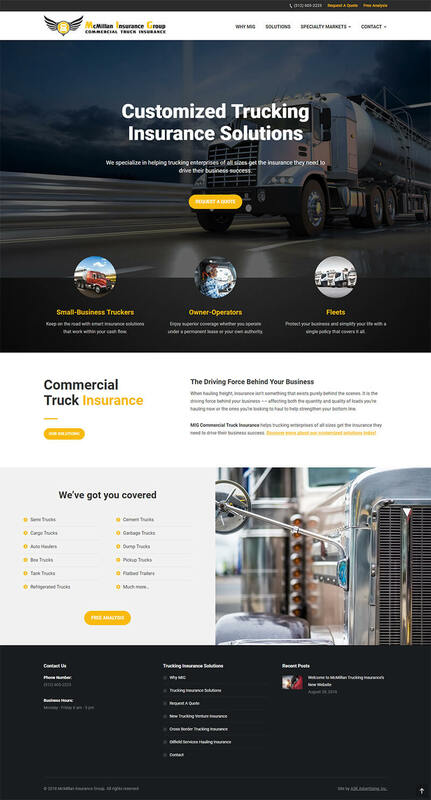 Client McMillan Trucking Insurance & A3K Advertising, Inc.